where: Via Vilje, NP Risnjak. f & d: bring snacks, especially water. Trekking to the Risnjak peak is possible via few different marked hiking trails. Most marked trails depart at the entrance to the Risnjak National Park. The shortest and easiest route starts from Vilje point. Departing from Crni Lug take the old road to Rijeka via Gornje Jelenje. At the T junction (this junction connects onto Rijeka-Zagreb which has a turn of for Krk island) turn right and then take first right turn, signposted by a wooden Risnjak/Vilje P sign. Reach "Vilje P" after 7km via gravel track. You can park here and continue by foot. The road is mainly a gravel track. Several points have pot holes and we recommend to drive carefully to avoid damage to the chassis. From Vilje start your journey by foot to the "vrh", the top of the Risnjak. The full walk is very well marked with signposts and also with the classic red-white spheres. From the mountain hut you can reach the real top in about 15 minutes. The way to the top is slightly more demanding that requires a little bit of climbing. The mountain hut Schlosserov Dom with capacity of 43 beds is open from 1.5 - 30.10, during this time the hut is shut every Monday after 5pm and on Tuesdays. You can eat something (stew or bean soup with sausage) and buy drinks. You have to bring water yourself, there is no running water. Take enough water for a return trip. For more info contact the Hut Manager Vesna Devcic 099/42-82-072, 099/22-82-07 or NP Risnjak office 051/836-133. Crni Lug to Gornje Jelenje: 20 minute drive. Gornje Jelenje to Vilje: 15 to 20 minute drive. 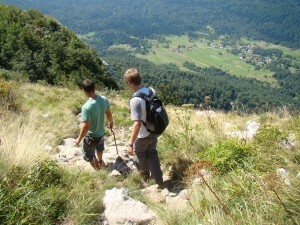 What: Mountain hike to the top of the Snjeznik. Where: West side Risnjak Mountains near Platak. F & D: provide yourself for walk and in Platak. 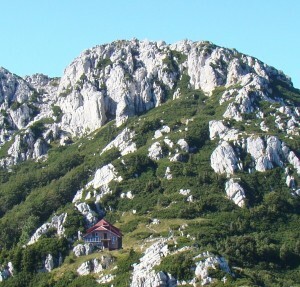 Snjeznik is the second highest peak of the "Risnjak" mountain range. This summit is situated just like the Guslica, on the west side, towards the sea. On top of the mountain there is a hut which is currently closed, awaiting refurbishment. The Snjeznik mountain is accessible via various hiking trails; Guslica trail or Risnjak to Snjeznik trail. 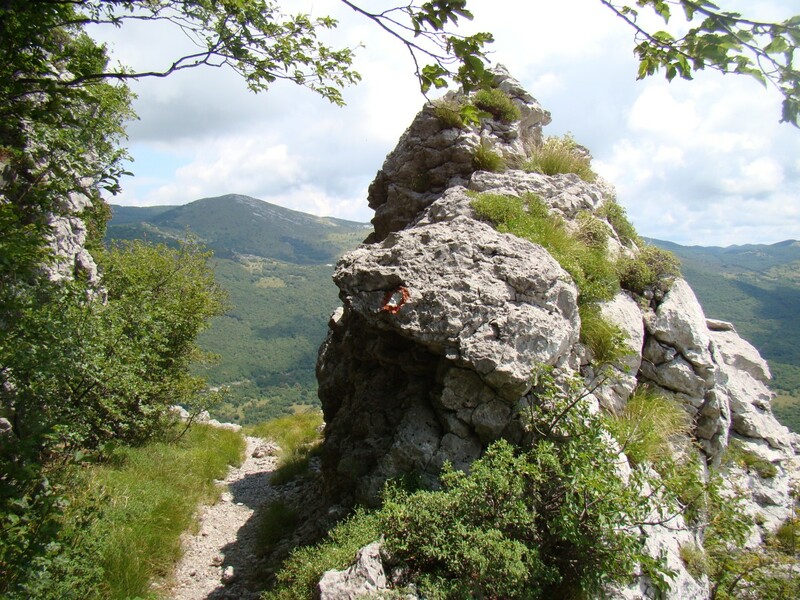 The easiest route to walk to the top of Snjeznik is via Platak. This ski resort is located on the western side of Gorski Kotar Mountains, it is set east of Rijeka and has a view of the Adriatic Sea. One can reach Platak via the old Rijeka-Zagreb road. Coming from Delnice drive towards Rijeka direction, pass Gornje Jelenje junction and after five kilometers take a right turn, signposted Platak. From Rijeka direction it is seven kilometers from the exit Kikovica (just before the toll booths of Grobnik) to Platak turn. Once you take the Platak turn, it is another eight kilometers to the Platak resort itself. 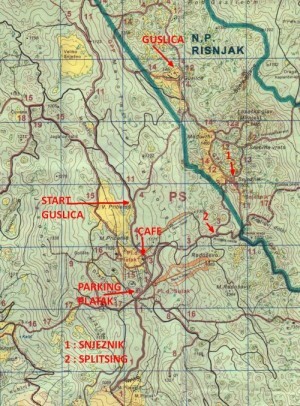 The hiking trail starts at the large Platak car park and runs to the right of the chalet, along the bottom of one of the ski slopes. Follow the red-white markings and the arrows. It is possible to drive one part of the journey on this gravel gravel road, up to a junction (see photo). This part is less than 2.5 km long and is the easiest part of the walk. At this junction you have an option of a left and a right turn. Both will take you to the top. We took the left turn which is also the fastest route. It goes through the forest and over the mountain tops, the route along the right goes over the ridge which is often rather windy. The first few hundred meters run along a forest track where vehicles can pass (forestry), afterwards it becomes a 'walking path' that is being redeveloped. The path is about one meter wide and the top layer consists of fine gravel. A part had already been excavated but not graveled, which was difficult at the time. Some pieces are quite steep, but still this trip can be done for children. Ones you reach this point you are approximately one hour to the hut at the top. The first part of the walk (up to the junction) runs largely via a gravel track that takes a few turns. The trail itself cuts 2 of those curves by going straight through the forest. These pieces are fairly steep and not really passable. Here follow the gravel track,rather than the forest road as its is quicker. At the top there is a mountain hut just a few meters from the real summit. It is somewhat slightly demending to get to the highest point due to the terrain configuration. The view from the hut terrace offers equally beautiful view of the surroundings. The views stretch over the Kvarner Bay from here and into neighbourng country of North Slovenia. What: a sturdy mountain walk to the top. Where: West side of Risnjak Mountains, near Platak. 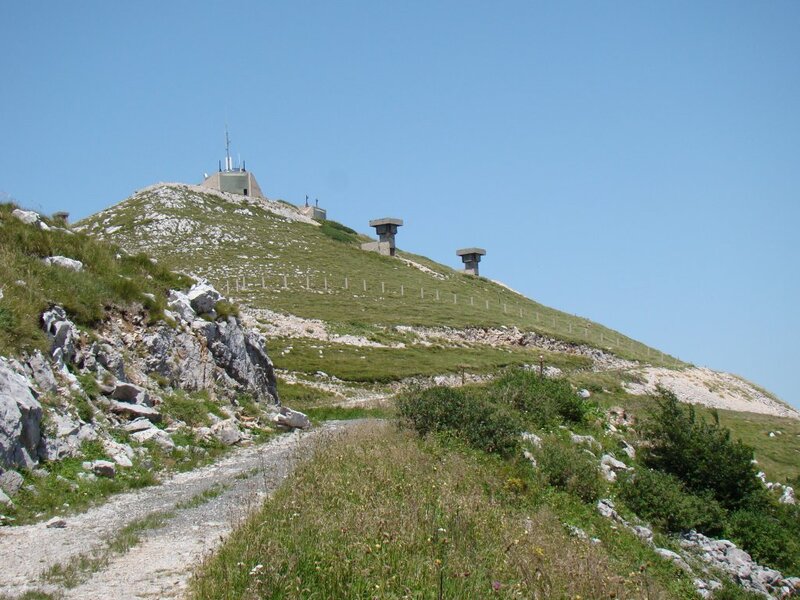 The Guslica summit was a listening post of the Yugoslav army before the fall of communism, during the time of civil war in Croatia. Here on this mountain top one could eavesdrop on the 'enemy'. Nowdays the ex military underground bunker complex is abandoned and it serves as a memory of past times. 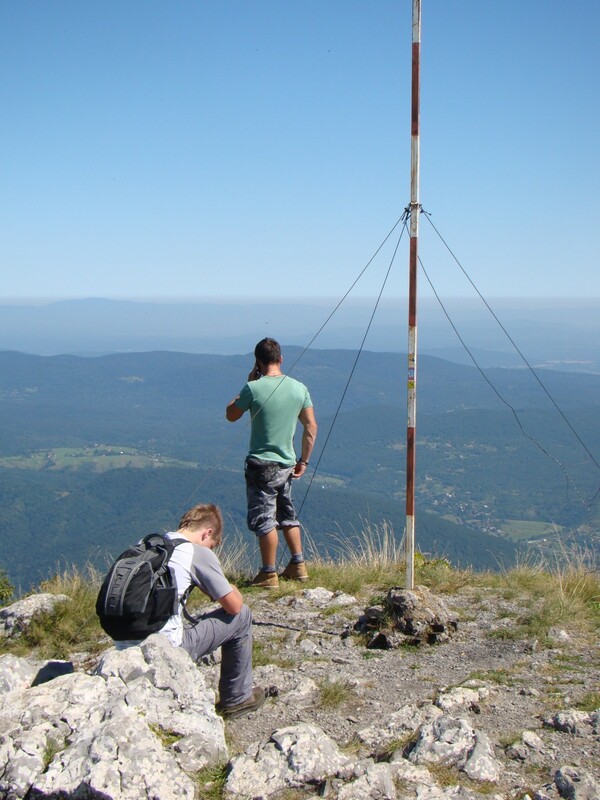 The mountain top is now mainly used for placing antennas for communication of all kinds. A bundle of GSM antennas, some satellite antennas and a sending station for the Croatian police services. There is also a large 'house' that serves as a mountain hut and as shelter for employees of the various communication services. One can reach the top with four-wheel-drive, although it is more enjoyable to walk it. The walk is short and in some parts it is challenging due to its steep slopes. It is easy to do if you take a slow walking pace. 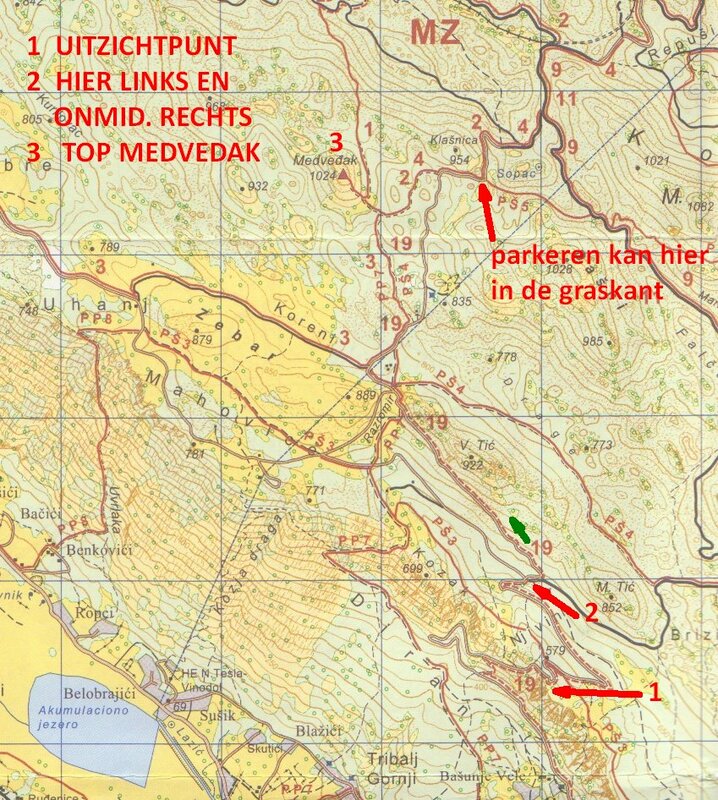 Going from the parking place at Platak, you can either leave your vehicle there or drive a bit further until you find a red-white signpost, about one mile on your right (past the open area on your left). From here you climb on foot. The first part is via an easily accessible paths. After this you will pass through a small meadow which leads into the forest. Here you have to go up steeply. Once you have passed the forest continue to climb up via an open surface, where it can be quite windy! The red and white indications have been painted on poles here due to the lack of trees or rocks. You end up on the gravel track that you follow the last hundreds of meters to the top. Here you have a stunning view of the Kvarner Bay! Where: Grobnik, on the Rijeka and Delnice road. F & D: bring your own for a walk. CafÃ© nearby. Time: one hour to 3 hours (25 '). Kamenjak is a small secluded group of steep limestone cliffs rising from the forest above the eastern side of Grobnik Field. This picturesque ridge is part of Dinaric Alps. 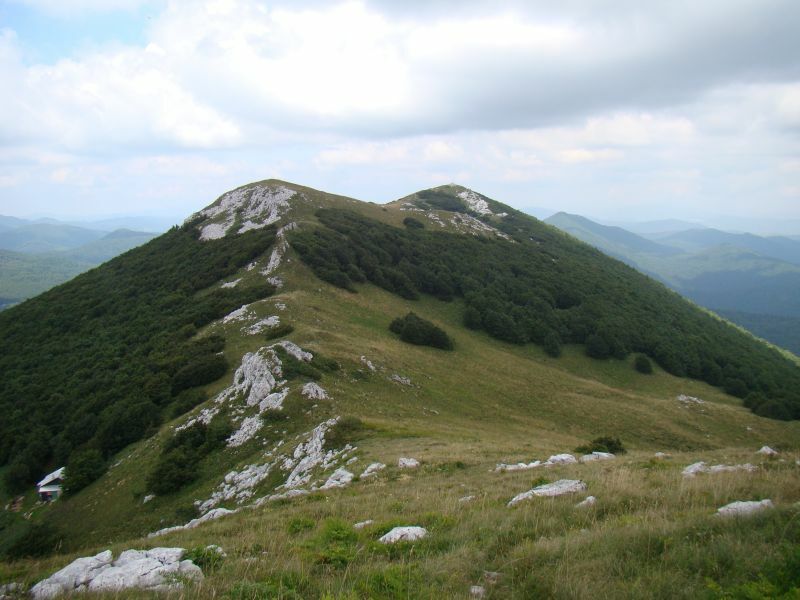 It stretches in length of 600m and consists of three tops - the main peak (V. Kamenjak, 837 m), the west (685 m, not mountainous) and the southeastern (Mali Kamenjak, 771 m) . The latter is the most picturesque and offers the most beautiful view. One can reach this location via the old Rijeka-Zagreb road. Beyond the plain of Grobnik (toll booths) coming from Rijeka, you will see some nice white rocks on your right. Inaccessible you will think unless you are an alpinist. Nothing is less true. You can just walk there. You can visit these three tops in a few hours, or you can choose one. To reach the viewpoint it will take you 20 minutes from the parking area. The walking distance from one mountain top to the next is from 10-40 minutes. The departure point is one of the car parks on the old Rijeka-Zagreb road. These car parks are curves on the road. The parking you need to have is between km post 6 and 7. 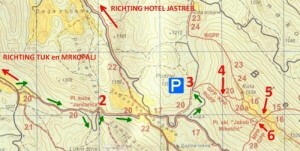 If you come from Delnice in the direction of Rijeka, the parking is on the left. It is quite dangerous to cross the street here. It is better to drive a bit further, to turn in a safe place and to drive back. 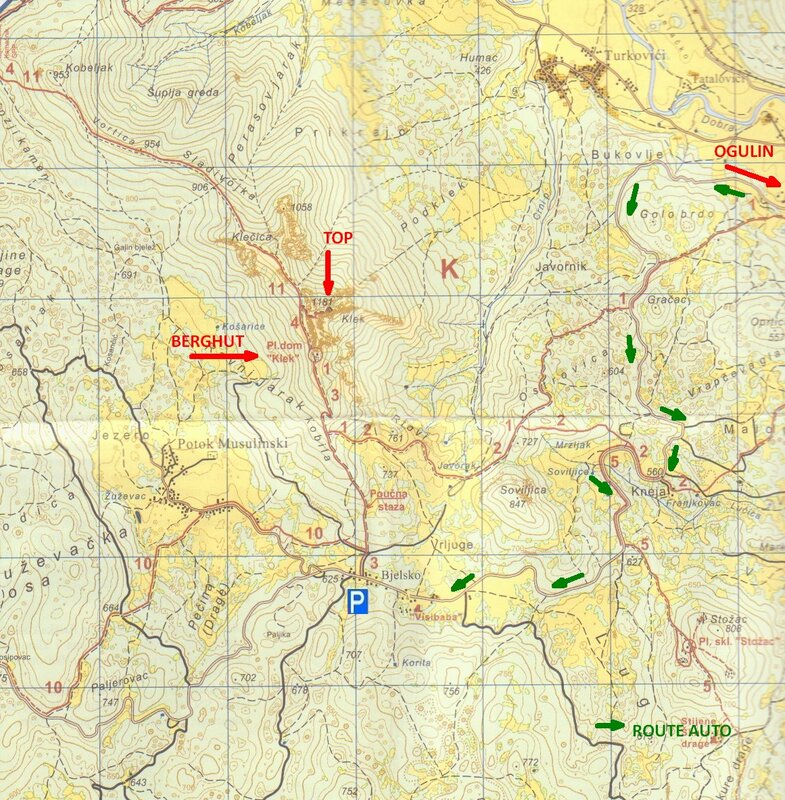 Continue straight on and after about 10 minutes you can go straight or sharp to the right (point K2). Take a right here in the direction of the large Kamenjak. Follow this path until you have reached the top (about 30 '). When you arrive at the top you can also go to the east side of the summit via some paths. From here you have a beautiful view of the Grobnik plain. Now take the same road back to K2. Now turn right towards small Kamenjak this takes about 15 minutes. At the small top you have a better view as there are no trees or bushes here. The last bit to the small top is slightly challenging. From the small top you can now go through the forest to the "bunker". This walk takes about half an hour and takes you to a bunker from the period between the 2 world wars. Until the Second World War, Rijeka was the border between Italy and Yugoslavia. This area was therefore militarily important. The part between bunker and "viewpoint" takes less than 10 minutes. Along the way you will encounter a well with a catch basin. The wells here are almost all rainwater wells. Further more towards Rijeka there is a cafÃ© bar with a view of the Kamenjak. Visevica Peak and Bukovac Cave. What: demanding mountain hike, small cave with picnic place. Where: Lic, south of Fuzine. F & D: to take a walk, and in Lic & Fuzine. Time: half a day to a whole day (40 '). 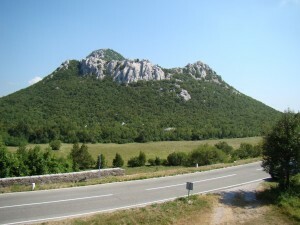 The Visevica Peak is positioned southeast of Lic village, which is part of Fuzine municipality. The summit is 1428 meters high,slightly lower than Risnjak. Here too you have a very good view of the Adriatic Sea, Kvarner Bay, the islands of Krk, Losinj and even the island of Rab. The first part of the walk goes partly over gravel tracks and smaller forest roads which are not too steep. The last part, however, is 45 Â° steep forest climb to the top and can be demanding for some. Departure: from Crni Lug drive via Delnice to Fuzine, via an old country road towards Rijeka, turn left at the Lokve exit towards Mrkopalj. Then take the first exit on the right towards Vrata and Fuzine. On the way you can stop for a while, but more about that later. Once you reach Fuzine, follow the left towards Lic village. When you reach Lic follow the signposts to Crikvenica (left on a fork). This road leads you through the Lic plain, which is known for its lavender production. Once you drive out of the plains, this asphalt road becomes pretty bad, so pay attention in order to avoid pot holes! From Lic it is still about 10 km to the starting point. Once you reach a straight part of the road, on the left side you will see a wooden sign with a painted bear,turn left here. This road is partly a black track on the map (so worse than a gravel track) but in reality it is a new paved road to the starting point. This piece is in better condition than the previous 10 km. There is a barrier at the beginning of this road, if the barrier is down,your walk will start here and it will be 2 km longer. Please note: this road is not widely used and there is a lot of gravel. Once you reach a sharp arch-type bend, there is a gravel track straight ahead. You can park here and start your walk. Follow the gravel track upwards. After hundred meters you will see signs on the right leading into the forest. After approximatelly 10 minutes you will come back on a gravel path. Follow this until you come to a 'T'. Here you go left. Follow this road for about a quarter of an hour and you will have to go right again, into the forest. Here it is becoming steeper. Once you are in south direction, the walk to the top becomes challenging. At the top there is still a lot of grass. 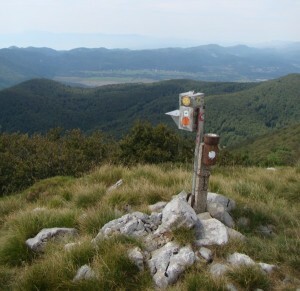 it is therefore not a rocky summit such as the Risnjak an has a great open view point over Lic plain. Do not forget to sign the guestbook and enjoy the view. The full walk from parking to the top is approximately 1 hour 45 minutes. The way back can take less - up to 45 minutes. You will encounter 2 lakes along the way. These are somewhat quite exceptional for karst area and provide a watering place for local wildlife. You are likely to encounter wildlife here during dawn and dusk rather then in the middle of the day. Apart from deers and birds, it is possible to spot bears too. 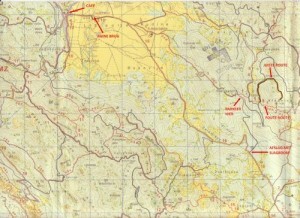 The total route from Crni Lug to start hike is 39 km. Bukovac Cave : After crossing the motorway towards Mrkopalj and taking the exit to Fuzine you will come across a cave on your left. Here you will find parking area as well as few tables and benches. 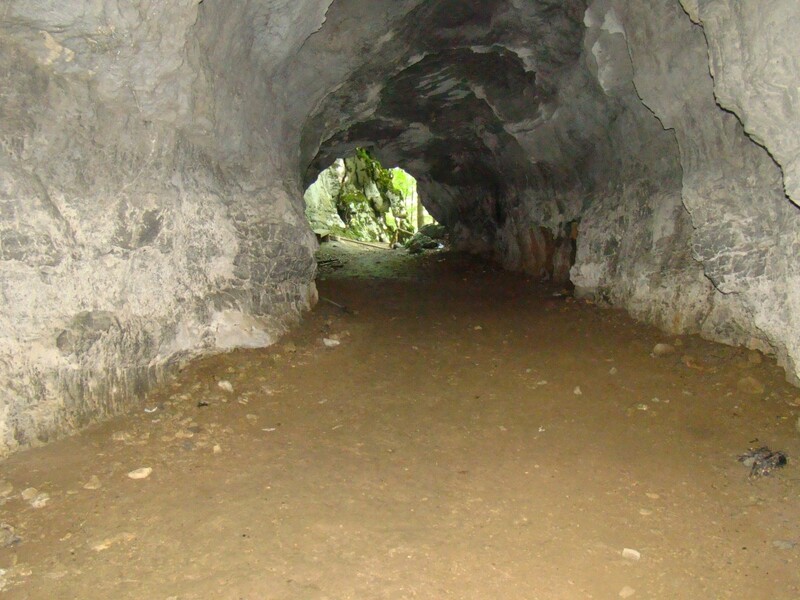 The cave itself is 50m long, it is completely flat and at the back it runs into a corridor which branches towards left and right. The cave was discovered 1912 by the Hungarian paleontologist Tivadar Kormos. The excavations at the back of the cave found the evidence of the presence of a paleolithic man in the area of a Dinaric karst. An evidence found was a finely crafted antler spike belnging to the culture of younger Aurignacian. The excavations also found the remains of skeletons of Pleistocene animals and birds such as cave bear, snow leopard, snow rabbit and an alpine snow partridge which were hunted by paleolithic man. To get to the back of the cave you have to bring a torch because it is already dark after a few meters. The cave temperture here is around 7 degress celsius. Just before you reach the cave you can also notice a stone building which looks like a small castle, right next to the road. This is an old military bunker which lies alonside of the railway. The railway continues immdiatey into a tunnel here. 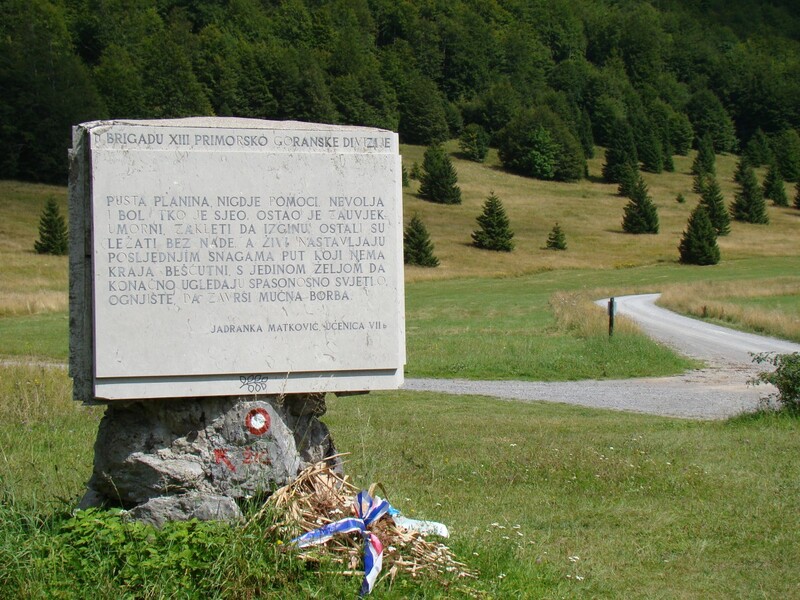 On April 11, 1941, the Italian occupation army crossed the Italian-Yugoslav border which was the bridge between Rijeka and SuÅ¡ak. They were heading via Luizijana towards Gorski Kotar. They established their italian military points at Mrzla Vodica and Lokve. The bunker served to disable any attempts to transport weapons and supplies through this area. Out of many bunkers built by the Italians Bukovac is the best preserved. After the capitulation of Italy on September 8, 1943 and the demolition of the railway bridge in FuÅ¾ine, the bunker was no longer used. Today the bunker is being treated and reconstructed by Lokve Municipality. Lic : In the center of this village opposite the 'town hall' you will find "The Legend Bar". After walking and exploring one can enjoy a tasty burger and a drink at an affordable price. The 'Legend bar' is on your right if you come from Fuzine and keep on the fork on the right. From here you can already find the red and white indications to the Visevica. The plain itself is also worth the effort to drive even quieter. You will also find plenty of juniper here, for example. From the center to the runway leading to the start you also pass the remains of an old bridge. F & D: bring your own for the walk. The rock formations Bijele i Samarske Stijene are situated in the area of Mrkopalj. Translated into English this would mean White Saddle rocks due to their colour and shape. Their formation is limestone and the snow and water have shaped them into different forms. They have a status of a strictly protected nature reserve since 1985. Both are accessible via designated walking paths. IT IS ADVISABLE TO MAKE THIS WALK WITH AN EXPERIENCED MOUNTAIN HIKER. These walks are more difficult than most others in Gorski Kotar. 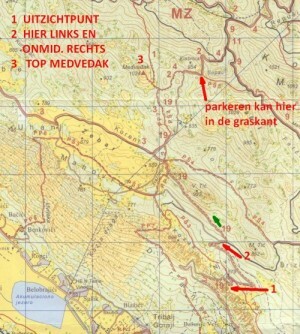 Especially those to Samarske Stijene is a pretty difficult climb. The real peaks of these rocks can only be reached by aplinists, but without climbing it, this walk is definitely worth it. From the main Rijeka Zagreb you cross the motorway in the direction of Mr Kopalj at Lokve. This municipality is known for its ski slopes. You also pass Sunger and some other small places. The route to your destination is certainly worth it. Mrkopalj and his smaller neighboring villages are located in a large valley. 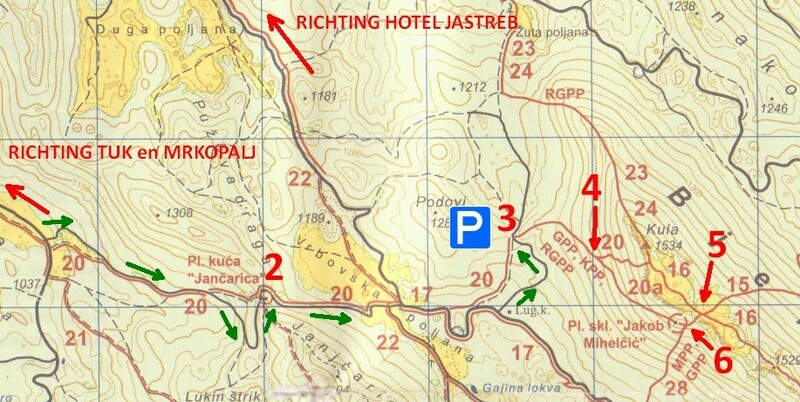 Once in Mrkopalj you take a right at the crossroads towards Tuk. Follow the road through Tuk. At a certain moment this course becomes a gravel track. After a few kilometers there is a junction, here you bear to the left. There is a clear signpost here, you can not miss it. Just past this junction you will see a memorial stone on the left and a series of stones placed in a gentle bend in the meadows to the right. This is a war memorial in honor of 26 partisans who froze to death in the winter of 1945. See also the photo in the foreword. At a certain moment you will notice a chalet on your left, somewhere in an open area close to the forest. You can park here already, but you can also continue driving, depending on how far you want to step. All in all, with the car from the exit Mrkopalj near Lokve, you can still spend an hour or so on the starting point of the walk. 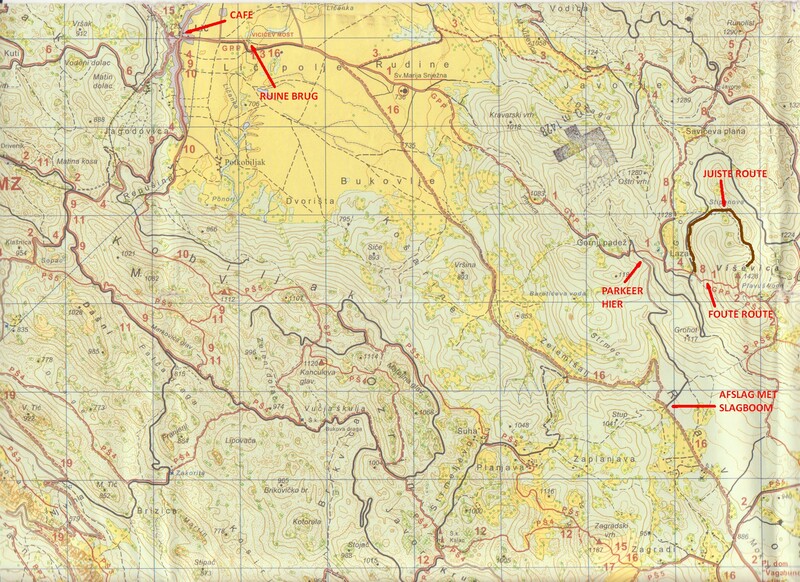 It is strongly recommended to use a mountain hiking map for this hike. The hike itself can take over 3 hours. It takes roughly 2 hours to reach Samarske Stijene and 1 hours on the way back. This is a demanding walk. There are many steep points which are a challenging terrain. Be sure to bring enough water, and also something to eat. Always inform someone of your whareaboouts when you set off on a long hike/walk. GSM reception is not always accessible in the rocy areas. 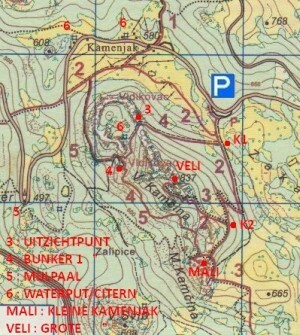 There is a shelter near the Samarske Stijene (Ratko's Shelter) and one near Bijele Stijene. If you look carefully you may notice an Edelweiss flower on the rocks. This flower as most plants here are strictly protected species. F & D: to bring for walk, restaurant on the way back. Bjelolasica resort was once the Olympic Center of Croatia with many sport facilities: from football fields to ski slopes. Bjelolasica is also a hikes' paradise too. 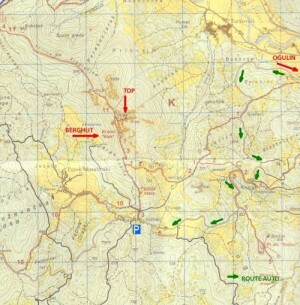 Here you will notice miles upon miles of untouched forest as well as the mountain peak "Kula" or Tower in eng. 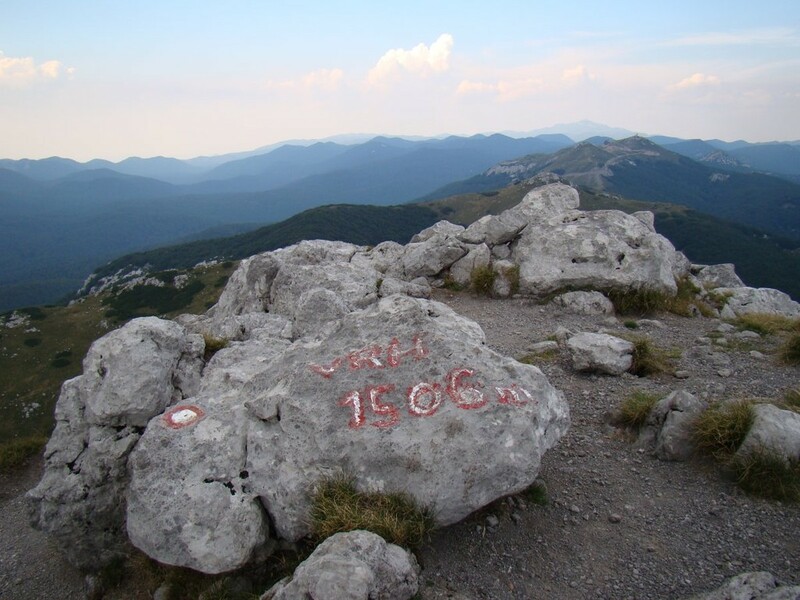 This peak is also better known as the Bjelolasica, so look out for this signs/markings.This mountain is located in the western part of Gorski Kotar mountain region and its he highest mountisn peak of this area (1534m). Bjelolasica is 7 kilometers long, and is characterized by a narrow ridge which stands out above the forest. From Delnice you drive towards Rijeka via an old road. At the junction where you can go right to Lokve (the caves) you can cross the highway on the left towards Mrkopalj. Follow this road. In Mrkopalj you continue towards Tuk (Vojni). Follow this narrow asphalt road. After a few kilometers this road becomes a gravel road. After about 1 km there is a junction where you follow the left. Slightly further in the open area you will see the 44 memorial stones in honor of the same number of partisans who froze here in the winter of 1944 during second world war. From here you follow the classic red and white indications on the trees or on the rocks, sometimes you also see red signposts. Follow the indicated path until you reach intersection , here you can take a shorter but very steep pier on the left. At the top you have to go a few dozen meters to the left to reach the actual top. At the top you will find a guestbook as usual. From here you can see Ravna Gora in the north. To return you can walk to the junction  and possibly even a little further to the next summit. It is somewhat more difficult because of the fairly high bushes that grow here. From point  you can then go down and a little further to the hiker's hut, Jacob Mihelcic, turn right to get back to point  and go back the same way. On your way back, after one kilometer turn right towards Begovo Razdolje, a village with a ski slope which is a part of the Olympic Center Bjelolasica. In this village you will find hotel Jastreb which is under construction in 2018. Next to it you can find a nice bar and restaurant. Follow the road and you will return to Mrkopalj. Where: 10 km from Ogulin (1 hour drive from Crni Lug). F & D: bring along for the walk itself. Eating and drinking facilities available in Ogulin. At 1,181 meters Klek is the highest peak in the Ogulin region. Klek is part of Velika Kapela mountain range, which is part of Dinaric Alps. You may notice its impressive rocky mountain top from the distance, when driving on the Rijeka-Zagreb motorway near Vrbovsko junction. Hiking up to Klek summit is a fairly difficult walk so it is advisable to take a slow pace and enjoy all the beautiful views. The height difference between the starting point and the top is 550 m. The last part near the top itself requires a small "climb". There are ropes which serve as "stair-handrails". You certainly do not have to be an alpinist. It takes approximately 1 hour drive from Crni Lug to the starting point near Klek from which you can start walking. In Delnice take the motorway towards Zagreb and exit at Vrbovsko. Continue via country road here towards Ogulin. The drive on this road is worth it, as it takes you through small villages and beautiful surroundings and along and across rivers. 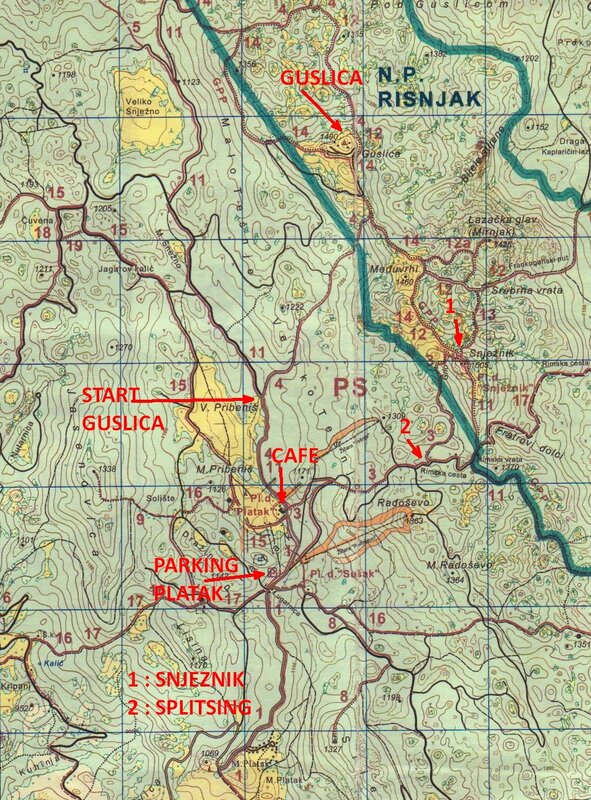 Before entering Ogulin, turn right towards Puskarici and Potok Musulinski. 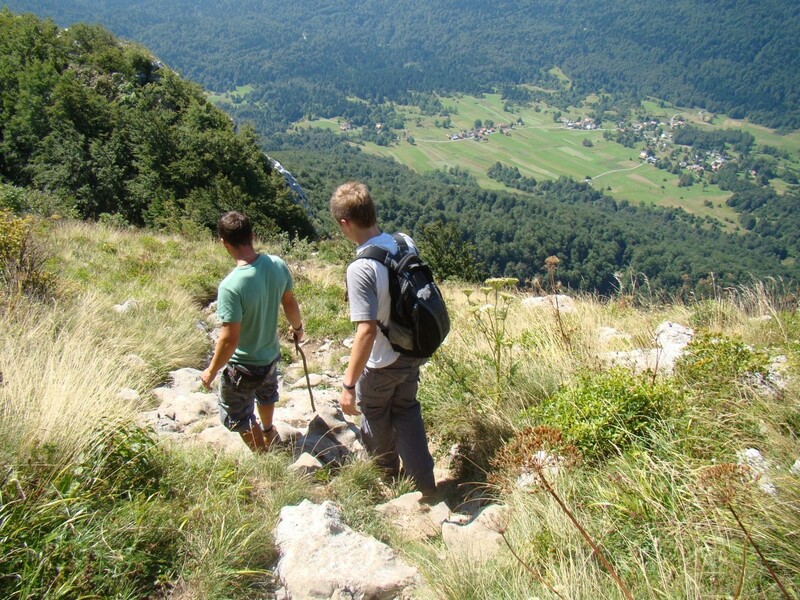 The walk starts in the village of Bjelsko, at an altitude of 630 meters. Bjelsko village is quite small with one street and a few houses. On your right side there is a sign painted on a large old house (an old woodsman house). You can park here ans start your walk here. After a few hundred meters follow the path to your left and you will find a large metal sign "Klek". From here the path continues through an old beech woods, which provides a great shade for the walkers during hot summer months (follow the red and white indications). 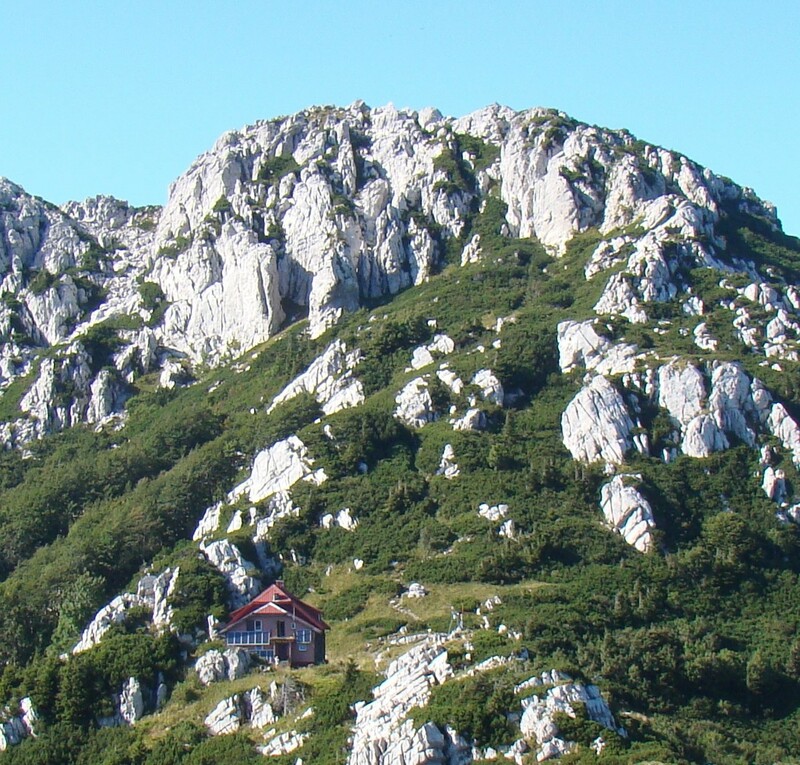 After approximatelly an hour you will arrive at the mountain hut Klek (42 beds). The mountain hut is open weekends only and it serves drinks only. Ensure to have enough food and water with you. Outside the hut there are tables and benches provided for picnic. From here it is another half an hour to the top. The contact numbers to check opening times in advance; Mr Franjo PetruÅ¡ic 098/827-737, 047/531- 206. 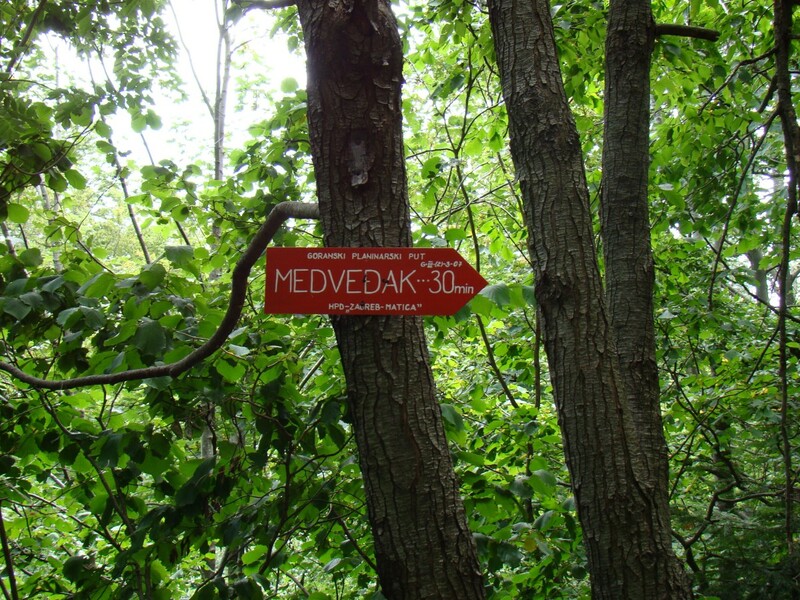 Just before you get to Klek mountin hut you may notice a sign which is written in croatian only and it reads; "Dobrodosli u carstvo Kleckih vjestica" which means "Welcome to the Witches' Empire of Klek". According to local folk stories the Klek peak was a gathering of witches on stormy nights, so they became a symbol of it. From the top one has a beautiful view of Ogulin town and the surrounding villages, as well as Risnjak , Medvednica, Sveta Gora. Ogulin is about 850 meters below. The way back is a bit faster and less difficult. An entire walk including the breaks is around 3 hours, plus 2 hour drive and an hour or so in Ogulin to eat, makes this a really beautiful 6 hour excursion. If it is warm and you wish to swim, you can do so in the Sabljaci lake south of Ogulin. The edges near the top can be steep so beware when you are walking with children. What: touring the Vinodol valley, climbing summit. Where: Vinodol valley between Lic (FuÅ¾ine) and the coast. F & D: in the villages in the valley. Time: half day, whole day. Depart Crni Lug and follow old road to Gornje Jelenje, take left towards Krk island. 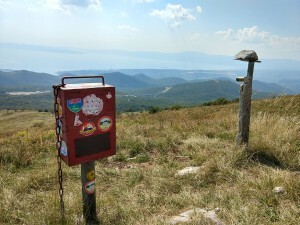 At the crossroad with six roads, (coordinates 45.260502, 14.611158) turn left towards Bribir, Grizane, Drivenik. You are now entering the Vinodol valley district. The valley offers rich history with many cultural and historic monuments, natural resources and tradition. The area is close to the sea, but it is separated from it by a mountain slope. Vinodol means a vineyard or a valley of wine. After a few kilometers look out for an old castle nearby Drivenik village or in croatian Gradina Drivenik. It dates back to 1288 and it is situated on the hill called Glavica (181m). The castle sits in front of the mountain range called 'Krizisce' opposite Tribaljsko polje (Tribalj field). Drivenik castle was built by Frankopans, an old aristocratic family of Croatia and it is one of the most preserved in the area. The castle was restored during 2011. Driving further on you will come across lake Tribalj, which is a fishing paradise. Obtaining a fishing licence is a must in Croatia . Lake Tribalj is abundant in grass carp, prussian carp, catfish, bighead carp, zander, eels, common roach and sunbleak. As you drive pass the lake turn left towards Belgrad. Four kilometers further on this road, before you reach Belgrad, take a left turn up the hill. Here you can reach Vidikovac pridva, one of a few viewpoints in this region known as "The Eyes of Vinodol". The track is rather narrow and runs upwards along the mountain flank, not ideal for drivers who dislike heights! 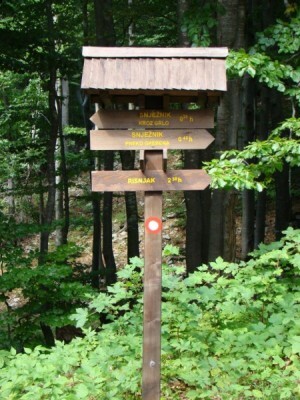 After 4km and many hairpin turns you will notice a sign with "Vidikovac Pridva". Park here and continue via foot to the viewpoint, 50 meters further. The view streches towards islands of Krk, Cres, Rab, Pag, Kvarner Bay, Selce, town and a part of Velebit massiv. Continue for mile and half until you reach two side streets; one runs to the left, the other to the right. Take the right. At the 2 consecutive crossings follow right. You are now driving towards Lic (FuÅ¾ine). The walk to the Medvidak starts at 3.1 km from the junction with the 2 roads. You can park your car a bit further in front of the bend in the roadside. This walk to the top is not that difficult, the height difference between the road and the top is only 125 meters, and takes about 30 minutes to the top. You have a very nice view of Rijeka, Krk, and the Vinodol valley. After this short walk we drive further and arrive automatically in Lic. From here you can return to Crni Lug via FuÅ¾ine. Possibly with a stopover in cafÃ© "The Legend Bar". F & D: bring everything, also drink. Tuhobic is an elongated steep mountain, which is located on the coastal edge of mountain plateau, from Gornje Jelenje to Fuzine, in the length of about 5 km. It is particularly interesting in terms of vegetational border which differs here between coastal and mountain plant species. From the top one can see Kvarner Bay, Rijeka, Ucka, Snjeznik, Risnjak and Medvidak, lake Bajer, lake lepenica. Tuhobic is also known as a tunnel on the Rijeka-Zagreb motorway 'somewhere' in Gorski Kotar region. 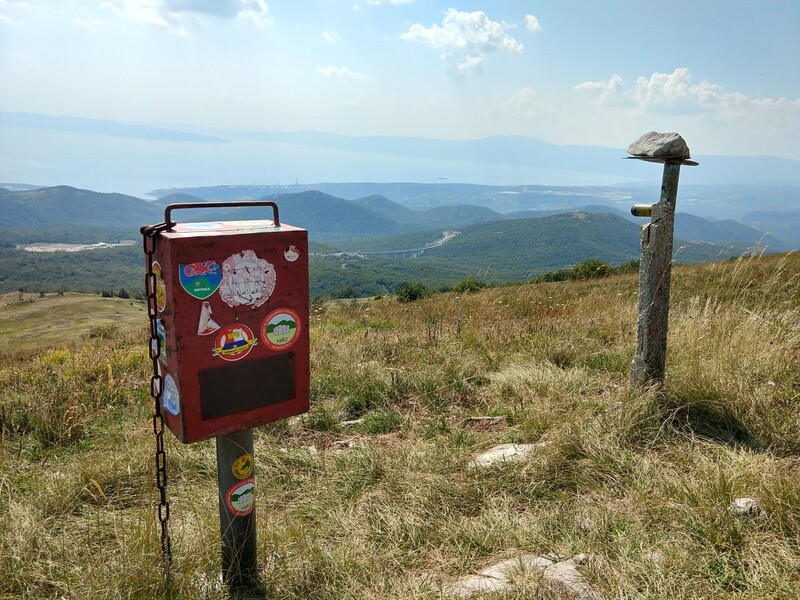 You can walk there in just over an hour, it is not far from Crni Lug and you have a beautiful view, both on the mountains of Gorski Kotar and on the coastline. Coming from the direction Rijeka driving in the direction Delnice to km-post 17 you will find on your right side an 'entrance' of a gravel track. Hard to see, there are still some heaps of sand. It is opposite the km-post 17. You can drive in here and then drive another 150 meters. Park there.
. Here you will notice a large wooden cross on the right. From here you can choose left or right direction. The road on the left is mosty a gravel track and then suddenly turns off and straight across the forest all the contours. Very steep climb. Count on 45 Â° up or 100% climb. The second route (which I took on the way back) first runs a bit away from the top to turn almost 180 Â° after a few hundred meters and into the forest. This route runs through forest through forest trails (ie fewer gravel tracks) and it takes longer but it is more pleasant in walking downhill. The way through the 'difficult' route took me a little over an hour. The route back about an hour. Both routes are well marked. The top is an open plain with no trees. Ideal for the view. It can be quite windy, even in the summer. There is a concrete 'monument'. Enjoy the scenery. From here you can see Risnjak peak, as well as Krk island and the rest of the Kvarner Bay. Height at the starting point (parking lot): 890 m.
Height at intersection with 'cross': 973 m.